Update your character's look with a Royal Hair Coupon or Royal Face Coupon! Check out the Male Hairstyles available now: Noah Hair (NEW! ), Teeny Horn Hair (NEW! ), Bow Bleached Hair, Cascading Bob Hair, Pure Bob Cut, Movie Star Hair. Check out the Female Hairstyles available now: Roan Hair (NEW! ), Miro Hair*(NEW! ), Immaculate Hair, Statement Hair, Whipped Hair, Goth Idol Hair. Check out the Male Face Styles available now: Little Star Cocoon Face (NEW! ), Melody Face (NEW! ), Dark Circle Face, Elf King Face, Constantly Curious Face, Boing Face. Check out the Female Face Styles available now:*Little Star Cocoon Face (NEW! ), Melody Face (NEW! ), Dark Circle Face, Elf Queen Face, Constant Surprise Face, Boing Face. 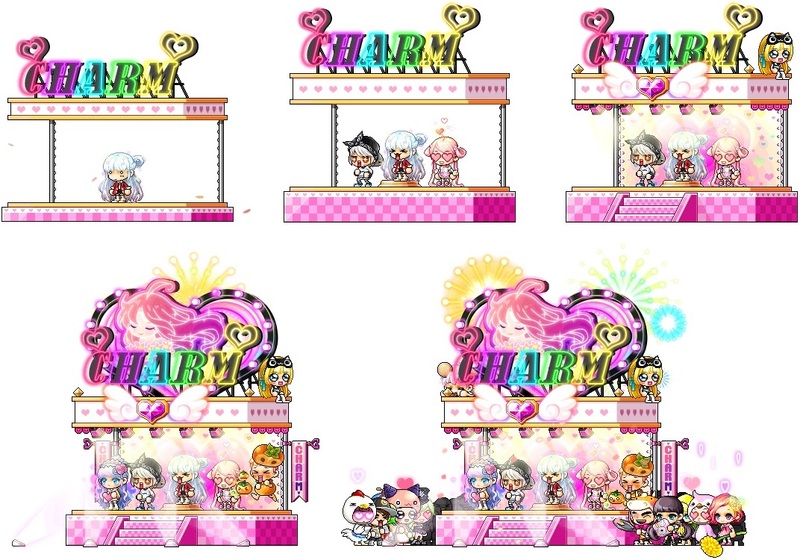 Relax in a beautiful new chair like the*Shoot for the Stars Chair,*The Boy of My Dreams,*The Claw Machine Chair,*and*The Girl of My Dreams Chair! Kick back in the*Android Companion Chair, the*Kinesis Cube Chair, the*Together with Kinesis Cube Chair, and the*Monster Gachapon Chair! Spend time enjoying the*Rainy Fox Chair, the*Maple World Chair, the*Fun Cloud Chair, and the*Mushroom Chair! Show off your style with the*Maple TV Chair, the*Loyal Royal Yeti Chair, the*Sleepy Bird Chair, and*Black Bean Chair! Have some silly fun with the*Comic Book Lounger, the*Peek-a-boo Drawer, the*Diabolical Chair, and the*Fiery Essence Chair! Open the Surprise Pet Box (available exclusively in Reboot world) to obtain one random pet! It contains both 90-day and permanent pets. Take home a permanent*Furry Elwin,*Fluffy Lily,*Baby Nero,*Kangaroo,*Skunk,*Hedgehog,*Salem Cat,*Binx Cat, or*Kit Cat! Take home a lazy Puparoo pet! Select from Cookie, Croquant, and Meringue. Summon Puparoo pets to obtain the Puparoo Power skill, which will increase your Weapon Attack and Magic Attack. The skill will grow stronger as you equip more Puparoo pets. The individual pet package comes with an equip to wear, yummy pet food to eat, a Pet Name Tag, and some useful pet skills and scrolls. Take home these lazy Puparoo pets! Pick up Cookie, Croquant, and Meringue and let these little buddies join you on your adventures in Reboot world! Light up the night sky with the*Little Star Cocoon Equipment Bundle! *Includes a Weapon Skin with special attack animations. Equip the whole set at once to gain a friendly little cloud buddy! Become a Hero of Maple with the*Mercedes' Hero Equipment Bundle! *Includes a Weapon Skin with special attack animations! Male and female versions both available. Become a Hero of Maple with the*Luminous' Hero Equipment Bundle! *Includes a Weapon Skin with special attack animations! Male and female versions both available. Become a Hero of Maple with the*Shade's Hero Equipment Bundle! *Includes a Weapon Skin with special attack animations! Male and female versions both available. Marvel Machine is back! The Marvel Machine is a game which allows you to play for in-game equipment and Cash Shop items on the MapleStory website. However, the Marvel Machine is only available for a limited time! You don't want to miss out on the chance to attain these highly desired items! Marvel Machine Spins can only be purchased with NX Prepaid. Note: NX spent on Marvel Machine spins will count toward your rank in the Maple Value Points (MVP) Service, and will be added to your MVP amount during a maintenance after Marvel Machine has ended. The Ring of Torment Coupon: Gives a ring that reduces the player's damage dealt by 30\% while granting a 15\% base EXP increase. Don't forget, you get THREE prizes for every spin, but your only chance to win is during the event period this week -- so spin away! Each Heroes Surprise Style Box holds a random permanent equip themed for one of the Heroes of Maple! There are 42 different permanent items available, themed for Evan, Aran, Phantom, Mercedes, Luminous, and Shade. In non-Reboot worlds, you can trade these style box items with other players through the Cash Item Trade window, if you haven’t equipped them. Right-click on a character to see the menu. Check out the items you can get from the Heroes Surprise Style Box! Secret Shade, Secret Shade Suit (F), Secret Shade Suit (M), Secret Shade Cape, Forgotten Hero's Knuckle, and Secret Shade Boots. Pick up weapon equip covers like Lil Mercedes, Lil Luminous, Lil Shade, Lil Evan, Lil Aran, and Lil Phantom! You can see the all the rewards rates for Heroes Style Surprise Boxes*here. Get a special new look themed for Heroes of Maple! Now is your chance to look like one of the six heroes of Maple World. Take your Heroes Royal Hair Coupon to NPC Big Headward in Henesys Hair Salon, or your Heroes Royal Face Coupon to NPC Nurse Pretty in Henesys Plastic Surgery to get your new style! You can preview the styles by double-clicking on the coupon in the Cash Shop. Check out the*Male Hairstyles available now: Elf King Hair, Polearm Warrior Hair, Phantom Hair, Glossy Flyaway Hair, Dragon Master Hair, and Forgotten Hero Hair. Check out the*Female Hairstyles available now: Elf Queen Hair, Polearm Warrior Hair, Phantom Hair, Glossy Flyaway Hair, Dragon Master Hair, and Forgotten Hero Hair. Check out the*Male Face Styles available now: Elf King Face, Polearm Warrior Face, Phantom Face, Heterochromia Face, Dragon Master Face, and Forgotten Hero Face. Check out the*Female Face Styles available now: Elf Queen Face, Polearm Warrior Face, Phantom Face, Heterochromia Face, Dragon Master Face, and Forgotten Hero Face. You can see the all the rewards rates for Heroes Royal Style Coupons*here. The Great Gachapierrot has added lots of new items! Pick up huge new chairs including the Friendship Forever Chair, the*Mushroom Land Hammock, and the*Snoozing Kitty Chair! 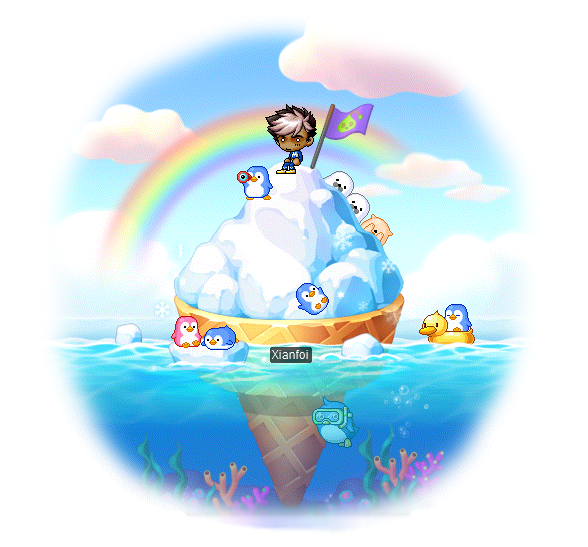 Take a seat on the huge new Ice Cream Glacier Chair! Get your hands on the Heroes of Maple Cutout Chair Coupon, and use it to receive one of the following chairs. You get to select which chair you want! Heroes Life-Sized Cutout Chair: Mercedes: (Untradeable.) A chair featuring Mercedes. Heroes Life-Sized Cutout Chair: Aran: (Untradeable.) A chair featuring Aran. Heroes Life-Sized Cutout Chair: Phantom: (Untradeable.) A chair featuring Phantom. Heroes Life-Sized Cutout Chair: Luminous: (Untradeable.) A chair featuring Luminous. Heroes Life-Sized Cutout Chair: Evan: (Untradeable.) A chair featuring Evan. Heroes Life-Sized Cutout Chair: Shade: (Untradeable.) A chair featuring Shade. Honor the heroes with the Deluxe Mercedes Flag Chair, Deluxe Aran Flag Chair, Deluxe Evan Flag Chair, Chair of Aran the Guardian, and Chair of Evan the Guardian. Sit down to a special feast with the Imperial Cygnus Feast Chair and Phantom's Banquet Chair. Chart your charm through your chair with Maple Congeniality. As your charm levels up to 25\%, 50\%, 75\%, and 100\%, the chair becomes fancier! Enjoy the*Friend Story Photo Chair, the*Ark Concept Chair, and the*Commander's Chair! Take a ride with new mounts including the Rallying Knights Mount, the Teatime Bunny Mount, and the*Paca Paca*Mount! These mounts are all available as permanent versions. Get ready to ride with the Cygnus Airship Mount, the*Claudine Airship Mount, the*Athena Airship Mount, the Athena Pierce's Support Mount,*the*Superhero Mount, the*Double Shinsoo Mount, and the*Onyx Jaguar Mount. 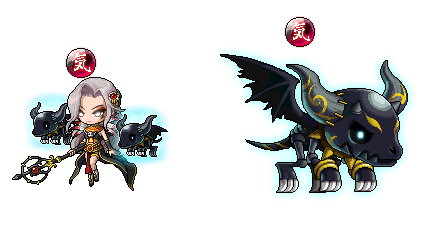 *These mounts are all available as permanent versions. Bring a new familiar along on your journeys, including*Hard Hilla and*Giant Blackheart! Pick up an old familiar or two, including*Pipsqueak Hilla,*Pipsqueak Magnus,*Pipsqueak Orchid,*Pipsqueak Von Leon,*Pipsqueak Arkarium, and*Pipsqueak Cygnus! New mounts have also come to Andersen's Box! Get*the*Rallying Knights Mount, the*Teatime Bunny Mount, the*Paca Paca*Mount,*the*Cygnus Airship Mount, the*Claudine Airship Mount, the*Athena Airship Mount, the*Athena Pierce's Support Mount,*the*Superhero*Mount, the*Double Shinsoo Mount, and the*Onyx Jaguar Mount! These mounts are all available as 90-day versions. Left to Right: Spring Green Ribbon, Spring Green Finery (F), Spring Green Slip-Ons;*Spring Green Finery (M), Spring Green Morning, Spring Green Foxtail;*Retro Scalene Rapier, Antagonist Face, Snowy Mountain Hat, Snowy Mountain Outfit. Left to Right:*Dreamland Unicorn, Crimson Fate Rosette, Crimson Fate Topcoat (F), Crimson Fate Shoes (F);*Catkerchief Sack, Catkerchief Packed Lunch, Catkerchief Doll Hat, Catkerchief Gloves, Catkerchief Doll Outfit, Nyan Nose;*Crimson Fate Mark, Crimson Fate Topcoat (M), Crimson Fate Shoes (M), Crimson Fate Seal, Blood Oath Weapon.